I did my undergrad in social sciences, followed by an MPH in biostatistics, at the University of Puerto Rico. The summer after completing my MPH, I moved to Michigan with my wife, Yabetza Vivas. She is studying orchestra conducting at Bowling Green State University. I worked as a biostatistician at the Child Health and Evaluation Research Center at the C.S. Mott Children's Hospital for two years. My boss there sparked my interest in the Michigan Public Health Epidemiology department. Based on my research interests, he said that social epidemiology might be the perfect program for me. With an interest in public health on top of my desire to get a PhD and become a professor, I was ready to go back to school. I am currently working with Carlos Mendes de Leon, professor of epidemiology at Michigan Public Health. We are planning for a dissertation about the Puerto Rican population, specifically older adults. We're working on psychosocial determinants of age-associated diseases in the Puerto Rican population in the United States and Puerto Rico. I'm in the process of writing my proposal right now, so it's not definite yet, but that's what I want to do. There is a huge public health problem in Puerto Rico that no one is talking about, which is the main reason for the focus of my dissertation. A decade ago, a mass migration began. The population is declining, and the percentage of the population that is older is on the rise. Of the people who migrate every year, 95 percent are between the ages of 25 and 45. People 65 and older now make up 25 percent of Puerto Rico's population. A decade ago, that segment was only 12 percent of the population. Working-age people are leaving, and the percentage of retirement-age people is growing. The economy is becoming unbalanced. This is threatening the health care system, which will be burdened by the lack of a taxbase. When I graduate from Michigan, we'll move back to Puerto Rico. I'd like to start a PhD program in social epidemiology because no program exists on the island right now. I think this is very important because people from Puerto Rico usually come to America to study and then stay here because the income opportunities and quality of life, among other things, are better. But I think we need people who go back home and introduce new ideas to people on the island. That's what I want to do in three years and I am encouraging others to do the same. I've talked to a couple professors that I've worked with about about this idea, but nothing is concrete yet. They like the idea, they see the need for it, and it seems that there might be funding for it. My wife and I felt the need to do something after Hurricane Maria. We talked with our families back home and understood the depths of the damage. Through a friend, we found an organization that was working on delivering donations to the island, and we got connected to them. After bringing up the idea of a donation drive with CSEPH, Philippa Clarke, professor of epidemiology, suggested that I expand it throughout the School of Public Health. Working with a few key people here, we introduced a donation box to the building's lobby and word spread around the school. The box had to be emptied seven times during the 14-day collection drive. It all happened naturally, and I am thankful for everyone who donated and helped us collect the items. We went to Puerto Rico over Thanksgiving break to help out. We started calling our friends from church back home and formed a team of five. Together, we launched a GoFundMe page and raised over $5,000, strictly from people we know personally who wanted to help. While down there, we did different events each day and had a lot of volunteers come help, solely from word of mouth. 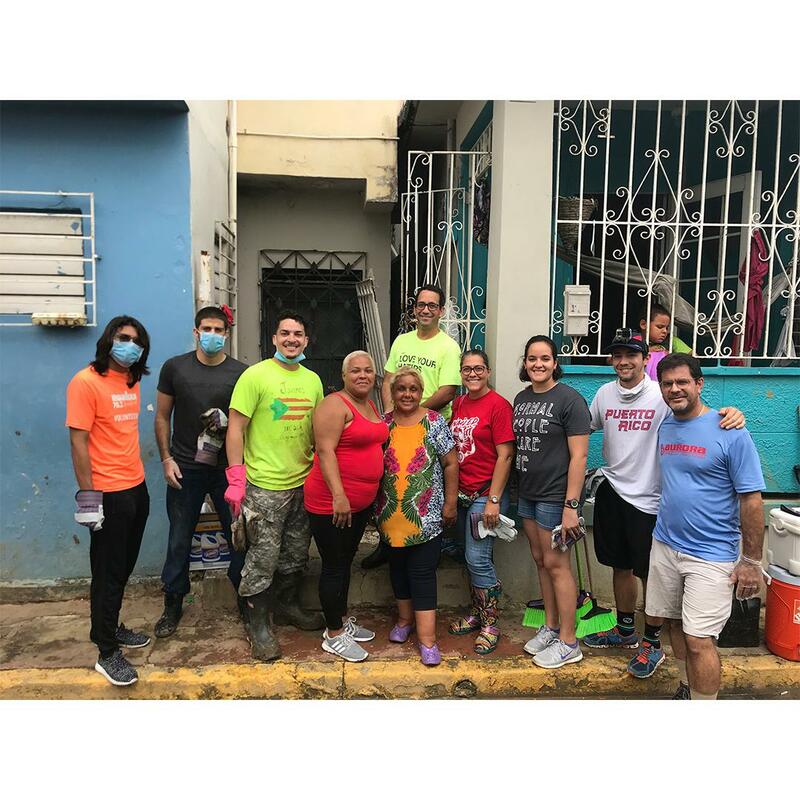 On the first day, we cleaned up a neighborhood in Toa Baja, a city that got six feet of water. 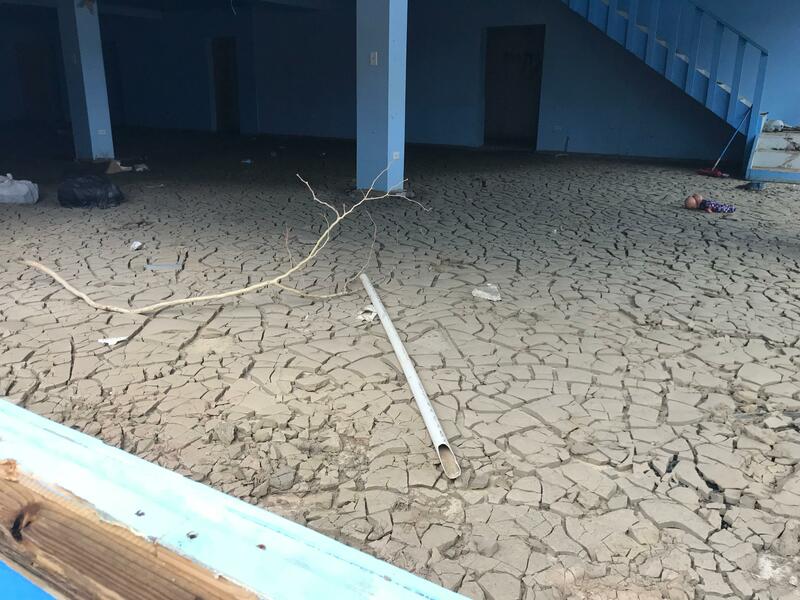 Homes were flooded with water and dried mud. 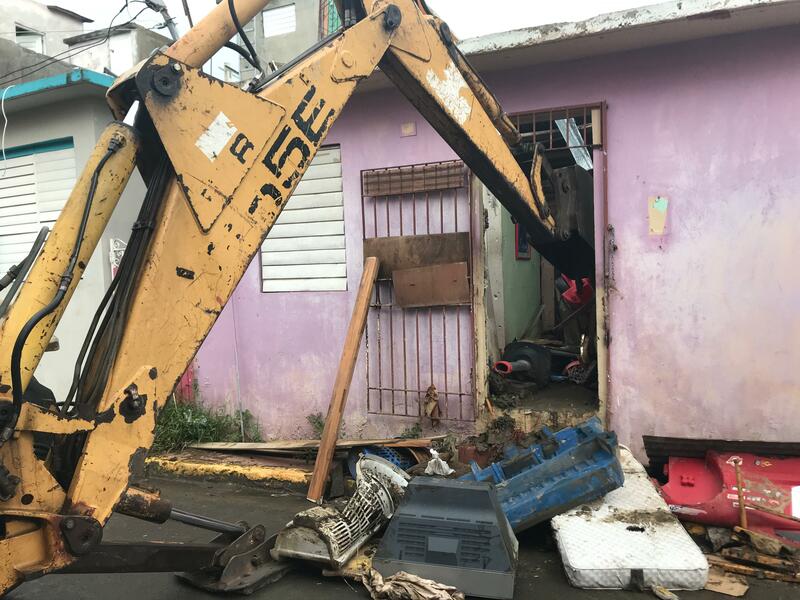 Amilcar Matos-Moreno’s group rented a digger and dump truck to not only clean out the homes but also to support the Puerto Rican economy. After a flood, there are a lot of appliances out on the street because they no longer function. Every single house had a fridge, microwave, and stove sitting outside. 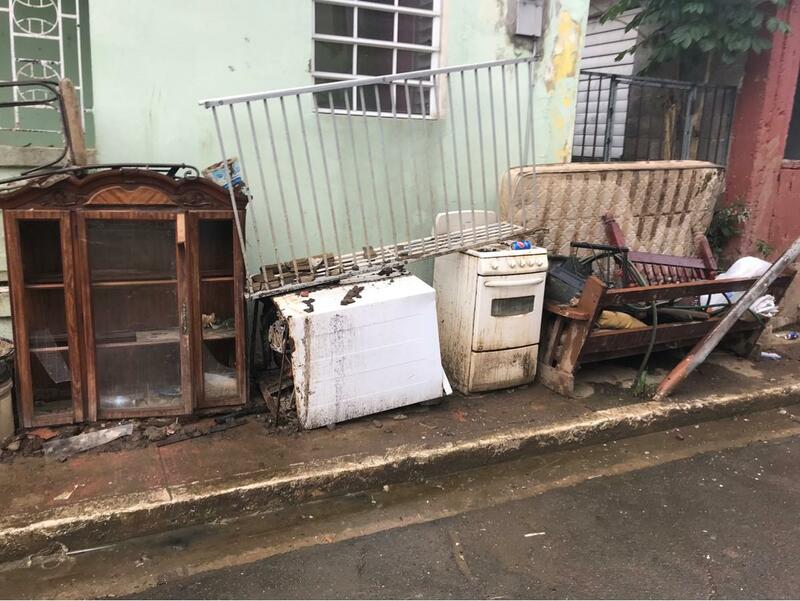 Matos-Moreno and the volunteers worked from 7 am to 5 pm picking up these appliances throughout the community and filled up a dump trunk seven times. 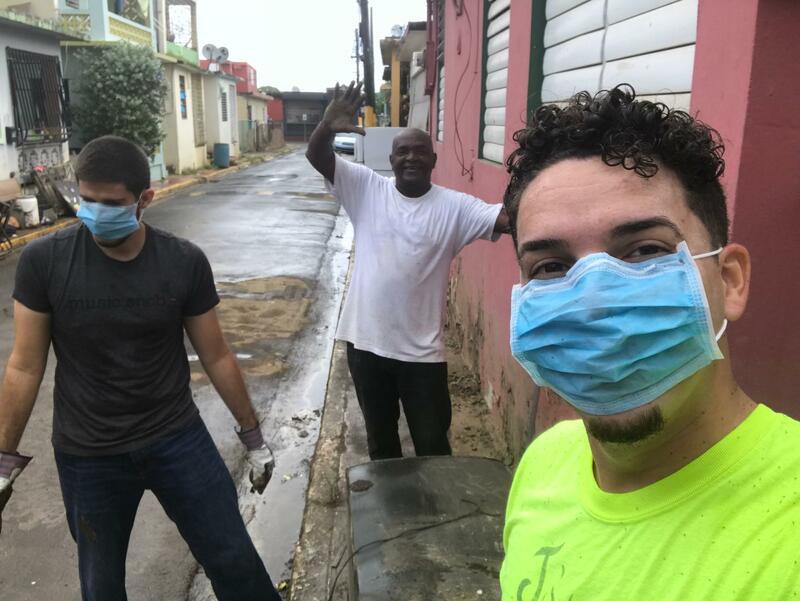 A selfie while cleaning houses in Toa Baja. Left to right: Matos-Moreno’s best friend Alfonso, community member and volunteer Ruben, and Matos-Moreno. Alfonso cancelled a Thanksgiving trip to Miami to lend a hand. Among the affected Toa Baja community members we were able to help was a partially blind 66-year-old woman named Maria who lives with her two grandsons, ages 5 and 7. Two months after the hurricane, the three of them were sleeping on an air mattress on top of six inches of dried mud with a rat and cockroach infestation. I hate sleeping on air mattresses, so I didn't want them sleeping on one either. Fortunately, we were able to purchase a new queen size bed for them and clean out the neighbor's house that caused the infestation. Amilcar Matos-Moreno with Maria and some of the volunteers that helped clean houses. Maria’s reaction after hearing the news that she would be receiving a new queen size bed. Left to right: Maria, Matos-Moreno’s sister Marisol and her daughter, Matos-Moreno, and Matos-Moreno’s wife's aunt Sandra. 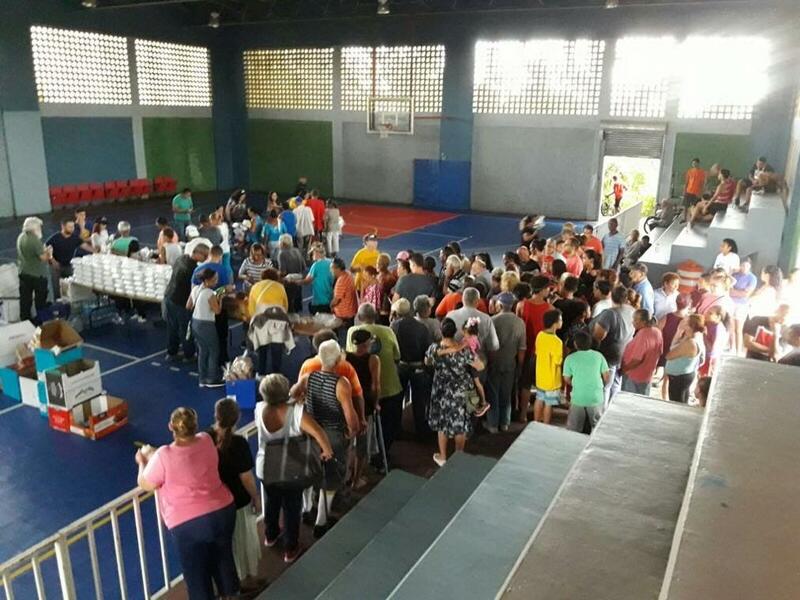 We also served 650 lunches and delivered 400 hygiene packages, helping more than 600 people in Toa Baja. We were able to provide free clothing to those who attended to the event. Volunteers, including Matos-Moreno’s nephew Yan (grey t-shirt), preparing hygiene packages the day before the event. 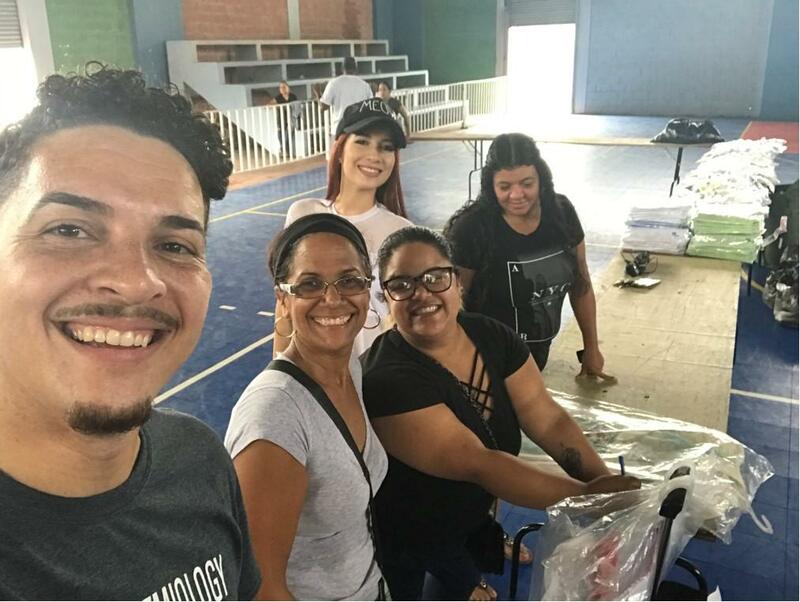 A selfie while setting up tables for food, hygiene packages, and clothing. 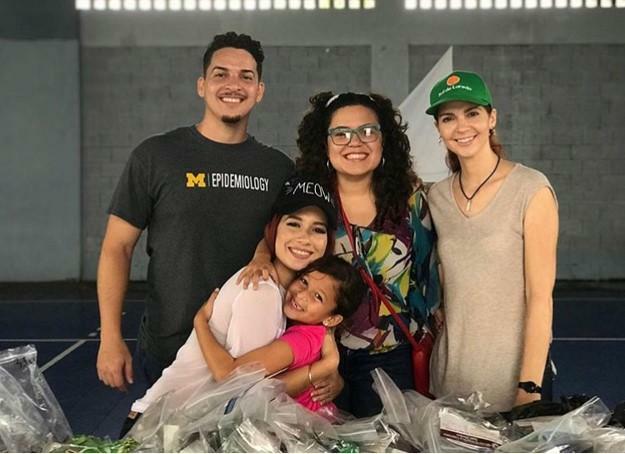 Left to right: Matos-Moreno, community team leader Nylmarie, Melba, Matos-Moreno’s sister Marisol, and a municipality worker volunteering at the event. In the background are clothes that were given away and suitcases used to transport the hygiene packages. People lined up for the hygiene packages, lunches, and clothes while the food was being prepared. A family group photo taken in the process of people picking up hygiene packages, food, and clothes. Left to right: Matos-Moreno, Matos-Moreno’s sister Marisol and her daughter, Matos-Moreno’s wife Yabetza, and Matos-Moreno’s sister Maribelle. 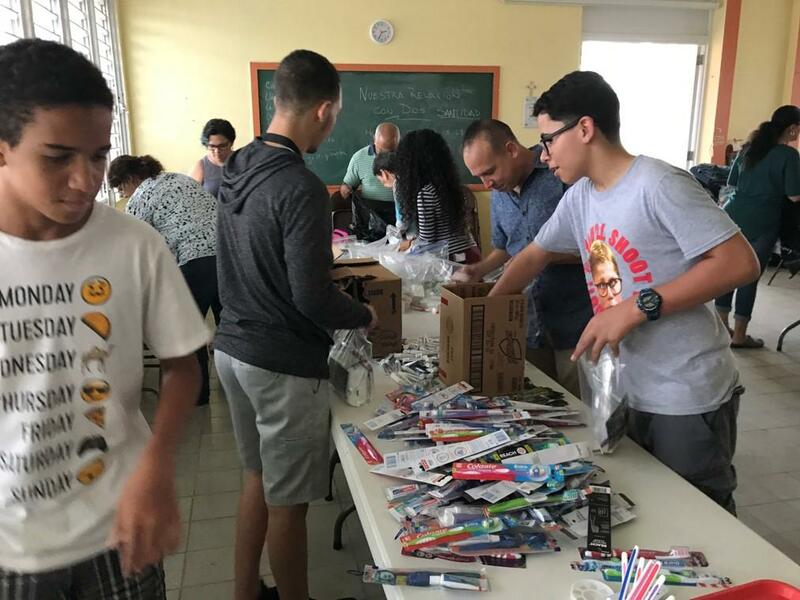 Other activities included cleaning out a Lutheran church in Toa Baja and hosting a Christmas party in Bayamón. Thankfully, the church was finally able to hold a service, two months after being flooded. Christmas is a big thing in Puerto Rico, so we hired some musicians from Conservatorio de Música de Puerto Rico and did a raffle for a lot of essential items that were donated, including water packages, water tablets, mosquito repellent, and other things. Attendees dancing and relaxing at the Christmas party. Attendees being served food at the Christmas party. Amilcar Matos-Moreno (middle) posing for a photo with his wife Yabetza (right), and nephew Yan (left) at the Christmas party. Support Matos-Moreno's March mission trip to Puerto Rico where he'll be part of a group putting up tarps and building wooden roofs for those who lost the roof of their homes.